CAM 1919.10. A and B. Trained in the famous workshops of his native Oberammergau, Bavaria, master carver John Kirchmayer immigrated to the United States in the 1880s and settled in Cambridge, Massachusetts. There, in the view of many, he developed into the finest woodcarver in the land, turning out hundreds of sculptures, decorative panels and other works of art for churches, businesses, institutions and private homes. Kirchmayer had close working relations with a number of prominent architects and artisans and was a founding member of the Society of Arts and Crafts, Boston. George Booth made Kirchmayer’s acquaintance through his Arts and Crafts activities and soon became one of his most ardent patrons, commissioning him to produce many carvings for Christ Church Cranbrook, Cranbrook House and the Booth Collection of decorative arts at the Detroit Museum of Art. 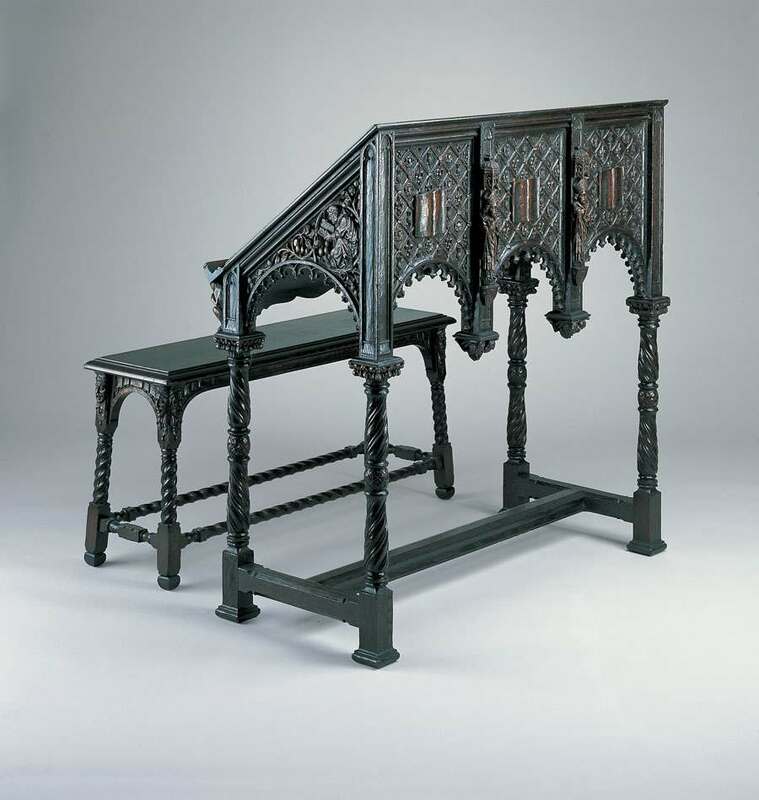 Booth particularly enjoyed his reading desk and bench, which Kirchmayer crafted for the Booths’ library in 1919 from a sketch that Booth supplied. At Booth’s request, Kirchmayer finished the Gothic-styled work in a dark stain to contrast it with the lighter woodwork of the room.